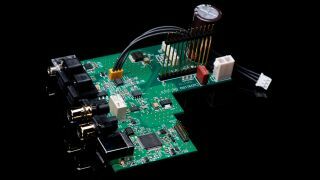 Cyrus announces QXR DAC upgrade for its amplifier range | What Hi-Fi? Cyrus has today announced a new QXR digital interface, a ‘significant’ DAC/headphone amplifier upgrade for any one of its integrated amplifiers and preamplifiers from the last decade. The QXR DAC card brings 32-bit/768kHz and DSD 512 file support through an all-new asynchronous USB bridge. The DAC also uses asynchronous upsampling for inferior audio signals. Via optical and coaxial connections, incoming audio signals are ‘reclocked’ to reduce jitter. Cyrus has worked hard to reduce noise in the circuit, and the headphone amplifier (capable of 138mW per channel into 16ohm loads) has been improved, too. Cyrus claims the QXR offers a 'major uplift' in sonic performance, saying that even customers who already have the QX DAC fitted to their product will hear a vast improvement. Those wishing to upgrade their products will need to register, after which they’ll be able to join the upgrade queue and await instructions on how to return their products to Cyrus. The QXR upgrade will cost £600 in the UK, and is compatible with: 82DAC, 82DAC Qx, 8 DAC, 8 DAC Qx, 8a, 6 DAC, 6a, 8 XP, 8 XPd, 8 XPd Qx, 6 XP, 6 XPd, Pre2DAC, Pre2DAC Qx, Pre DAC, Pre DAC Qx, Pre XP, Pre XPd and Pre XPd Qx. It will also be available to buy new in Cyrus’ 6 DAC QXR, 82DAC QXR and Pre2DAC QXR products.